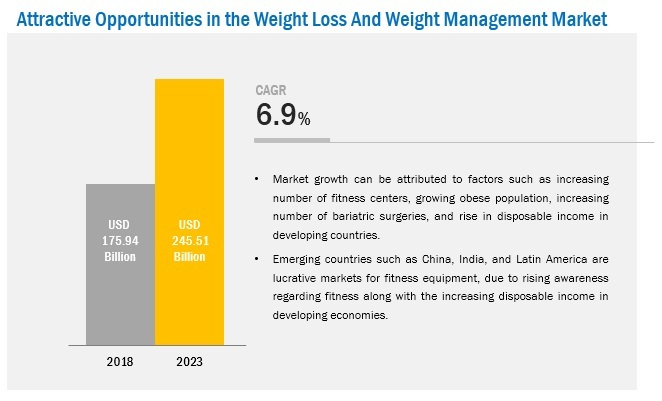 [187 Pages Report] The weight loss and weight management market is expected to reach USD 245.51 billion by 2022 from USD 165.81 billion in 2016, at a CAGR of 6.9% from 2017 to 2022. Market growth can be attributed to increasing obese population, increasing number of bariatric surgeries, growing adoption of online weight loss and weight management programs, rise in disposable income in developing economies, sedentary lifestyle, and increasing government initiatives for creating awareness among obese populations. The base year considered for the study is 2016, and the forecast has been provided for the period between 2017 and 2022. Growing rate of obesity is the major drivers for the market. Globally, the number of people suffering from obesity has increased significantly over the years. Unhealthy eating habits and sedentary lifestyles are the major factors responsible for the rising obesity rates across the globe. Governments across the globe have identified the immediate need to improve the health and well-being of the population and are taking necessary steps to increase the awareness for the same. In addition to favourable government initiatives, the awareness about health and well-being has increased among the population in several countries, and people are increasingly focusing on leading a healthy lifestyle. These factors are creating a favorable environment for the greater uptake of weight loss and weight management products and services across the globe. To describe and forecast the reed sensor market, in terms of value, by region–Asia, Europe, North America, and Rest of the World (RoW). 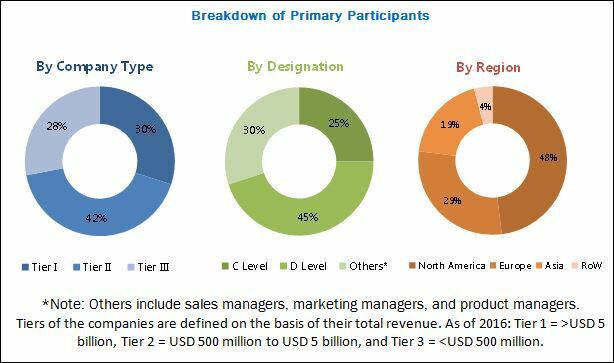 During this research study, major players operating in the weight loss and weight management market in various regions have been identified, and their offerings, regional presence, and distribution channels have been analyzed through in-depth discussions. Top-down and bottom-up approaches have been used to determine the overall market size. Sizes of the other individual markets have been estimated using the percentage splits obtained through secondary sources such as Hoovers, Bloomberg BusinessWeek, and Factiva, along with primary respondents. The entire procedure includes the study of the annual and financial reports of the top market players and extensive interviews with industry experts such as CEOs, VPs, directors, and marketing executives for key insights (both qualitative and quantitative) pertaining to the market. The figure below shows the breakdown of the primaries on the basis of the company type, designation, and region considered during the research study. 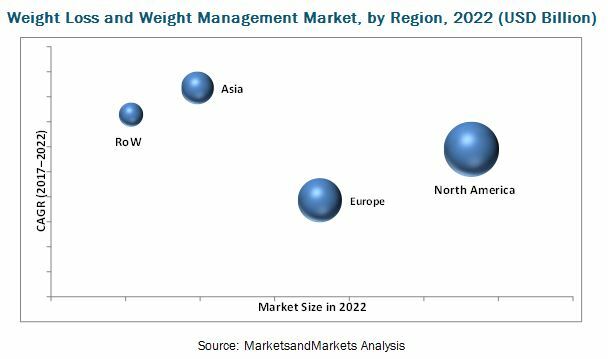 The weight loss and weight management market comprises a network of players involved in the research and product development; distribution and sale; and post-sales services. 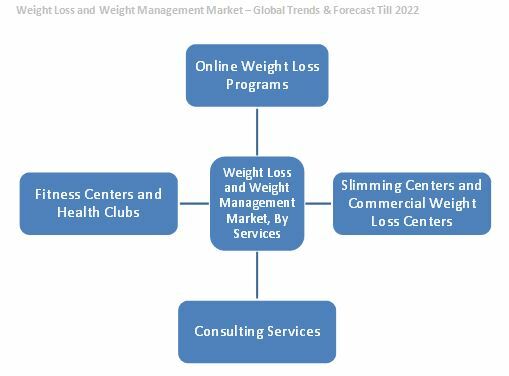 Key players considered in the analysis of the weight loss and weight management market are (Weight Watchers) (US), Jenny Craig (US), eDiets.com (US), VLCC Healthcare Ltd. (VLCC) (India), Slimming World (UK), The Gold’s Gym International (Gold’s Gym) (US), Duke Diet & Fitness Center (Duke Diet) (US), 24 hours Fitness (US), Equinox, Inc. (Equinox) (US), Life Time Fitness Inc. (Life Time Fitness) (US), Fitness First Group (Fitness First) (US), and Town Sports International Holdings, Inc. (Town Sports) (US). In 2017, Conyers Park and Atkins combined to form a new holding company, The Simply Good Foods Company. This company is expected to expand its platform through investment opportunities in the snacking space and broader food category. In 2017, Brunswick partnered with VirZOOM To launch the VirZOOM solution, which is expected to transform Life Fitness's Discover SE3 bikes into a virtual reality experience. In 2016, Brunswick acquired Indoor Cycling Group (ICG). The acquisition expanded Brunswick’s portfolio of fitness products. What are new application areas which the weight loss and weight management companies are exploring? Fitness centers offer group exercises, personalized programs, timely body composition analyses, water workouts, yoga sessions, spinning sessions, and cardiovascular exercises for weight management and physical health and fitness. Increasing awareness of fitness has led to the introduction of new and creative techniques such as Zumba, which help burn calories more effectively. This segment includes services offered by dieticians, nutritionists, and other weight management professionals who evaluate each individual’s lifestyle to help address the medical, nutritional, and behavioural issues related to weight gain. Considering the health requirements of individuals, diet and nutrition consultants prescribe and plan specialized nutritional and diet plans to maintain the recommended calorie consumption. Dieticians provide services such as children diet consulting, hypertension diet consulting, diabetes diet consulting, pregnancy diet consulting, and cholesterol diet consulting, among others. Slimming centres are known for their commercial weight loss programs, which include slimming techniques that do not require heavy workout sessions. They offer various programs, such as vacuum therapies, mud therapies, cool sculpting, steam baths, cellulite control therapies, acupressure therapies, diet modification plans, balanced diets, and customized weight loss programs. These programs are very effective for individuals who avoid physical workout sessions. High cost of low-calorie diet is a major concern in the industry, when will this scenario ease out? Emerging countries have immense opportunities for the growth of weight loss and weight management market, will this scenario continue? Most of the manufacturer have opted new product launches as the key strategies as could be seen from the recent developments. Where will it take the industry in the mid to long term? The weight loss and weight management market is projected to reach USD 245.51 billion by 2022 from USD 175.94 billion in 2017, at a CAGR of 6.9%. Factors such as growing obesity rates, increasing number of bariatric surgeries, and increasing prevalence of lifestyle diseases are driving the global weight loss and weight management market. The fundamental cause of obesity and being overweight is an energy imbalance between the calories consumed and the calories expended. Changes in dietary and physical activity patterns due to the increasingly sedentary nature of work, changing modes of transportation, and increasing urbanization has led to a raised body mass index (BMI) which is a major risk factor for non-communicable diseases such as cardiovascular diseases, diabetes, musculoskeletal disorders, and cancer. Based on diet, the weight loss and weight management market is segmented into beverages, supplements, and meals. Supplements is projected to register the highest CAGR during the forecast period. Supplements includes protein, fibre, green tea extract, and conjugate linoleic acid. The top two reasons for taking supplements among supplement users were for overall health/wellness benefits and to fill nutrient gaps in their diet. Busy work schedules and rising disposable incomes are the other factors supporting the growth of this segment. The weight loss and weight management market in Asia is expected to grow at the highest CAGR during the forecast period. The high growth in this market is attributed to increasing obesity rates and diabetes prevalence, the low cost of bariatric surgeries (which is promoting medical tourism in the region), rising disposable income, and increasing awareness about nutrition and healthy lifestyles. While the weight loss and weight management market presents significant growth opportunities, market growth may be hindered due to the high cost of low-calorie diets and deceptive marketing practices. Online weight loss programs form the fastest growing services segment. This segment includes weight loss programs offered through internet subscriptions, which enable users to follow these programs from any location through their mobiles or tablets. These services also include digital diet plans and nutritional supplements, meal delivery services, nutritional guidelines, fitness and workout videos, online recipe magazines, fitness magazines, and online consulting with dietitians and nutritionists. Market players are expanding their existing offerings and increasing their customer base by increasing the number of online and mobile-friendly solutions that are more convenient for users in terms of following their weight loss and weight management goals. What are the upcoming industry applications for weight loss and weight management? Owing to the additional processing required for low-calorie products, low-calorie foods and beverages are generally more expensive than high-calorie food products. Also, a low-calorie product contains nutrients such as vitamins and minerals, which makes it a nutrient-rich food. A low-calorie diet can cost around USD 36.32 per day, which is expensive as compared to a high-calorie diet which costs around USD 3.52 per day. Since medium- and low-income families find it difficult to afford high-priced diet foods and beverages and onsite fitness programs, they generally opt for low-priced alternatives such as acupressure therapy, acupuncture therapy, and Ayurvedic treatments for weight loss. In addition, consumers are increasingly moving towards no-cost or low-cost alternatives, which include natural weight loss options like jogging and brisk walks; free-access online weight loss regimens, programs, and books; and exercise videos. These consumers add minimum value to the weight loss and weight management market, and the growing adoption of low-cost/no-cost alternatives can further restrain the growth of this market. Key players in the market include Atkins Nutritionals, Inc. (Atkins) (US), Herbalife Ltd. (Herbalife) (US), Nutrisystem Ltd. (Nutrisystem) (US), and Kellogg Company (Kellogg) (US). Ethicon, Inc. (Ethicon) (US), Covidien, plc. (Covidien) (US), Apollo Endosurgery (US), Weight Watchers International (Weight Watchers) (US), Jenny Craig (US), eDiets.com (US), and VLCC Healthcare Ltd. (VLCC) (India). These players are increasingly undertaking mergers and acquisitions, and product launches to develop and introduce new technologies and products in the market.